KUCHING: The feat by three students from Sarawak in achieving excellent results in their Sijil Tinggi Persekolahan Malaysia (STPM) examination last year was recognised during a ceremony held in Putrajaya yesterday morning. 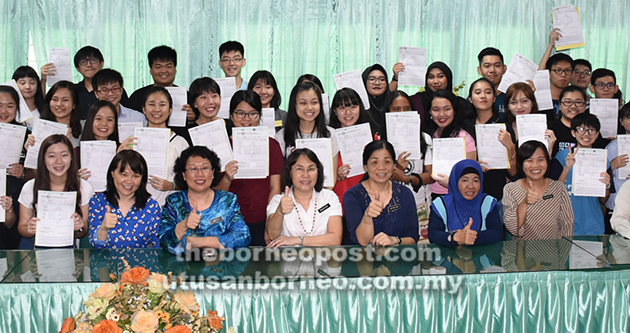 The top-scorers are Bonnie Chong Kai Hui of SMK Green Road in Kuching, Ervina Tang Sze Cheen of SMK Chung Hua Sibu, and Ebelind Min Slanjat of SMK St Augustine in Betong. Meanwhile, Wayne Ho Xiun Liang of SMK Datuk Patinggi Haji Abdul Gapor in Kuching scored excellent results on the Malaysian University English Test (MUET) 2017. According to state Education Department director Rakayah Madon, overall a total of 24 schools in Sarawak exceeded the Grade Point Average (GPA) of 2.80 for STPM 2017, versus only four schools in 2016. Moreover, SMK Sacred Heart, Sibu was named the school with the best performance for STPM 2017, with a GPA of 3.35. SMK Asajaya (Samarahan), SMK Tung Hua Sibu, SMK Agama Limbang, and SMK St Joseph (Kuching). On individual achievements, a total of 51 students – or 0.96 per cent of Sarawakian candidates – scored the maximum GPA of 4.00 for STPM 2017. A total of 1,726 (33.59 per cent) scored GPA 3.00 and above, versus 1,428 (29.94 per cent) in 2016. A total of 5,329 candidates registered for STPM last year in Sarawak, up from 5,290 in 2016. From the total (2017), 5,319 or 99.81 per cent are from national schools, while 10 of them (0.91 per cent) are private candidates. The candidates set to receive their STPM 2017 certificates are 5,055, or 98.17 per cent of the total. “The STPM 2017 results are very encouraging, as it shows an increase in GPA for Sarawak compared with 2016 – going from GPA 2.59 to GPA 2.64,” said Rakayah.